See below for our range of cheap saucepan sets. These saucepans sets are handy for a quick fix until your budget allows you to invest in something more long term. They are also ideal as additional saucepans to keep as backup for those times of the year when you need more saucepans for all the trimmings you need to cook for Christmas and Easter family feasts. They are also handy to have if you are a landlord and rent out a property. 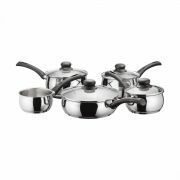 You can supply these saucepan sets and you not worry about having to replace them if needs be.